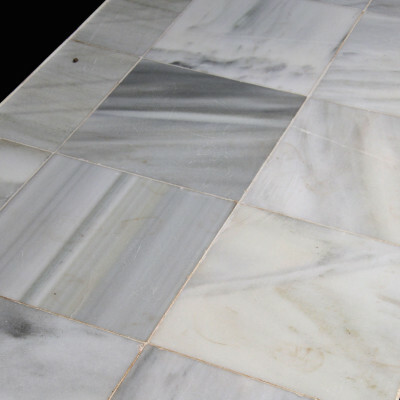 CATALOGNE - Square antique grey veined marble tiles dating from the 19th. (11 x 11 in. to 19 x 19 in. - 3/4 to 1 1/8 in. thick) During the Italian Renaissance marble floors are rediscovered, thanks to the study of the Treaty of the Roman architect Vitruvius (1st century AD). The Renaissance architects make marble floors arranged in compartments, the design follows from the structure of the edifice. Limited quantity.